We know how hard Yahoo! must be feeling when it’s particularly left out in the competition for the top sites of the World. Google, today maintains it’s top spot considering it’s versatility, Facebook stands at the second spot due to it’s enormous Social Media presence. YouTube grabs the third spot as it came out with a bright Concept due to which Google decided to take it up. Yahoo! is sadly left out from the top three at least & it grabs the forth spot just a bit ahead of Microsoft’s Live Search. Do you remember those days when you first opened your Email Accounts ? Probably you may have started with a Yahoo! Mail as it was enormously famous at that time. Even I started with Yahoo! Mail. Then gradually with the refreshing ideas Google brought in, people started moving away from Yahoo! and it’s services. 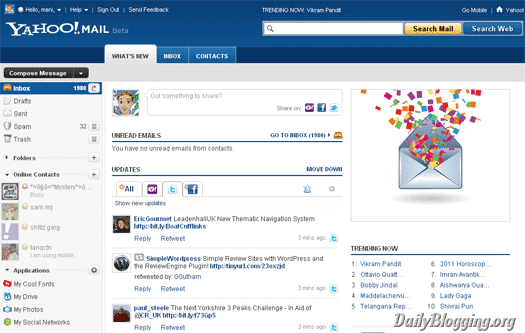 In the year 2007, Yahoo brought out a revamped Mail service by completely changing the interface; giving it a Web 2.0 kind of look & adding more applications & features. But many didn’t like it as they loved the old Interface which was used to them by now. So that plan flopped too. This time they have brought another BETA Interface giving it more elegant looks. This time it’s not just the looks. What I like about this Yahoo! Mail BETA Interface is that it’s more organized than ever. Lets quickly take a look at some features that stand out in this new version. Yes, with the addition of a Social Media notification box which includes Twitter, Facebook updates. But unlike out sites which displays only updates, Yahoo! 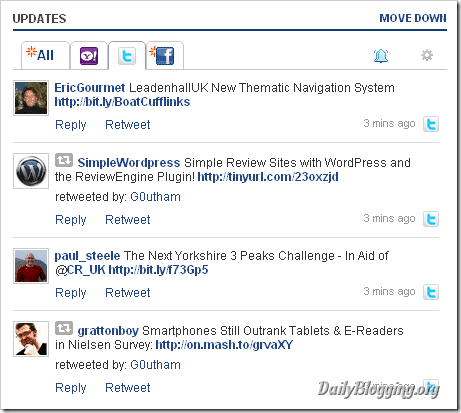 has added the ability to Retweet & Reply to tweets. 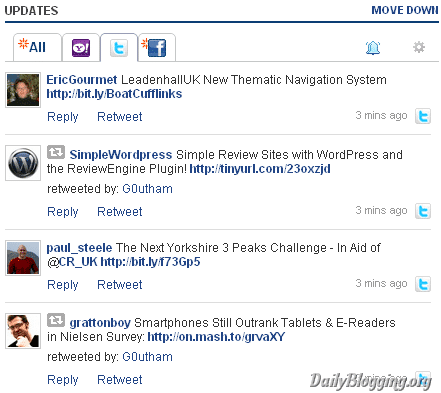 On the other hand it has also added the ability to Comment & Like Facebook Updates. So you don’t need third party Social Media apps for keeping a check on your Social Media accounts. In the past 2 years Yahoo! allowed us to chat inside Yahoo! Mail. This BETA Interface is quite similar to what GMail does in terms of chatting inside your Mail account. 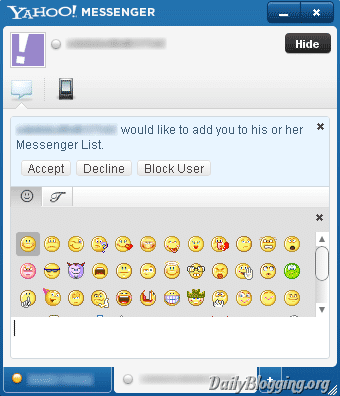 But I loved the design of the inline chat box which Yahoo! has embedded in the Mail Window. It has a single box which is fixed to it’s width. As the number of chatters increase, additional tabs get added in that box with which you can chat with ease. These are the features which stand out for me in this new Interface. As I said earlier the entire design is changed, so you’ll love the new look. If you still haven’t got an opportunity to preview the new interface, then logon to your Yahoo! Mail and you’ll receive a pop-up alert to Preview the new version. So do you like the new Yahoo! Mail Interface ? I think this is bettr than the old yahoo… 🙂 yahoo update a lot to compete with gmail..
like google, yahoo trying to improve itself to prepare to compete google. Still , it’s “Yahoo!” and still i will only go for Gmail ! Me too, I am using Gmail much more compared to Yahoo mail. Just logged into my account after reading this article. Well, still it looks not good to me. I am going to stick with Gmail for now. I like about this Yahoo! Mail BETA Interface is that it’s more organized than ever. Mail BETA Interface is that it’s more organized than ever. yahoo trying to improve itself to prepare to compete google. About time they updated it! I must say I really like the look of the new interface, it looks cool. I think the old design has been place for about 10 years, correct me if I’m wrong!? Yahoo mail is one of the best mailings platforms in the earlier day, now it needs some improvements to cope with new technology.